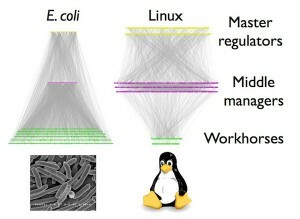 The call graph of the Linux OS com-pared to the genome of the E. coli bacterium (http://bit.ly/1qjC4p4). Consider: If the Encyclopedia Britannica has 300 million letters, that means we have something like 10 encyclopedia sets in each of our cell nuclei! We marvel at how big our hard drives can get now in gigabytes and terabytes, but they are enormous and clunky comparisons to the storage capacity God invented: the DNA molecule. 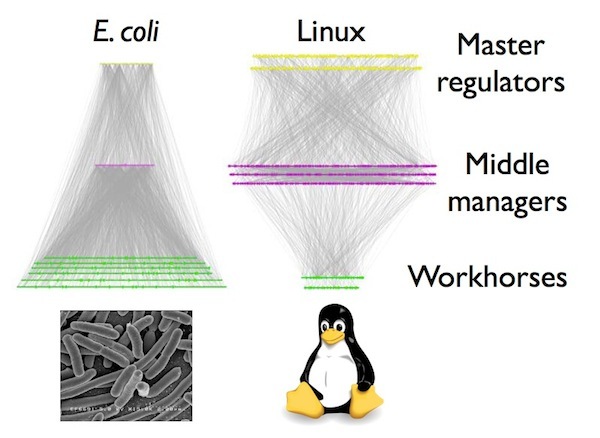 “From the results of the ENCODE project specifically, the world has been given a glimpse inside the most sophisticated computer operating system in the known universe — the human genome. But it is not a protein computer. Actually, the genome is more like an RNA super-computer that *outputs* protein. In a similar way to your computer, which has a hard drive, rewritable memory (RAM), and a screen for output, the genomic computer has DNA for information storage, RNA for information comparison and calculation, and protein for output.” (Evolution’s Achilles’ Heel, 2014, p. 58). See the clip above of Evolution’s Achilles’ Heels. This was a terrifically done film by CMI which I highly recommend on the topics of biology, the impossibility of evolution, and so forth. Behold, what God has hidden for us! Is it not time to seek him, the author of this all? Previous PostPrevious CPT Q005 – Are sediments in trenches deformed and contorted as expected?